Public Spirit is a forum for researchers, policymakers, politicians and practitioners from the voluntary and community sectors to debate recent developments in faith and public policy that crosses political affiliations and religious traditions. We feature articles and reports from a wide variety of contributors from academia, politics, policymaking and faith-based and community organisations, with the aim of making accessible recent research findings, sharing a range of expertise reflections and analysis and stimulating conversation about religion and public policy. A Research Fellow at the University of Kent. Until 2012 he was Research Associate on the Muslim Participation in Contemporary Governance project. His sociology research has focused on post-migration religion and politics. The article was originally published here on May 6 and forms the introduction to a series of interesting pieces focusing on faith and politics in Tower Hamlets, including one from the Rt Rev Adrian Newman, Bishop of Stepney. Tower Hamlets is seldom far from the public eye. The upcoming election for Mayor of Tower Hamlets and John Ware’s recent BBC Panorama programme on current Mayor Lutfur Rahman have returned the spotlight to this diverse area of East London. In this article, Daniel Nilsson DeHanas provides a brief guide to immigration history in Tower Hamlets, places current issues in context, and looks ahead to new concerns that may shape the East End for years to come. 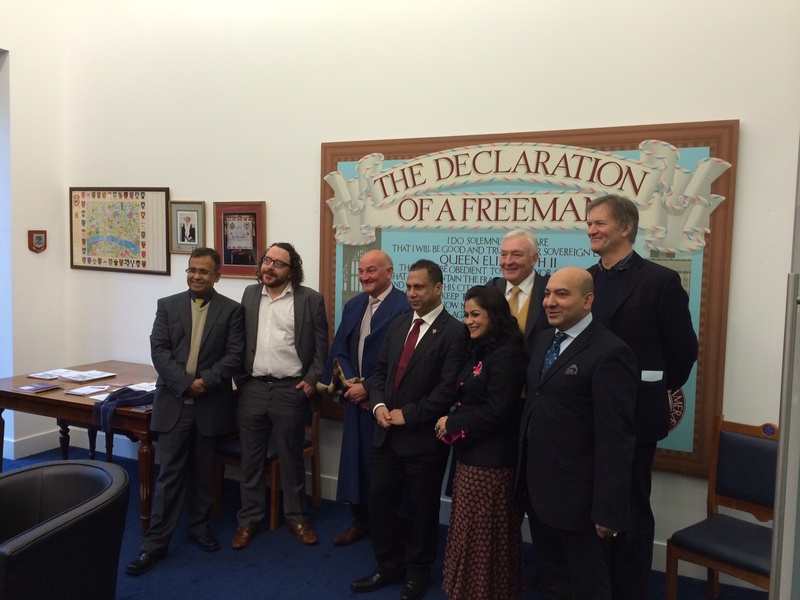 This article is one of a series on faith and politics in Tower Hamlets. The East End of London has long captured public imaginations. While the neatly trimmed parks and avenues of London’s West End are renowned for luxury and for proximity to political power, the East End conjures images of crowded alleys and docks, a mongrel conurbation of hard toil, poverty, and criminality. The contemporary London Borough of Tower Hamlets roughly corresponds with the historic East End and has been shaped by a long history of immigration. Historical accounts of East End immigration conventionally begin with Huguenots fleeing French persecution after the Edict of Nantes was revoked in 1685, many of them entering the silk trade. Following the Huguenots, there was an influx of Irish who escaped the potato famine of the mid 1800s. It was next that Jews, fleeing Russian pogroms, arrived in the late Nineteenth Century. In this same period Jack the Ripper murdered hapless female victims in the overcrowded slums, Charles Booth pioneered detailed mapping of the area’s poverty, and William Booth, touched by the poverty, founded the Salvation Army. The Jewish population of the East End swelled to over 100,000 by the turn of the Twentieth Century and the area took on the informal designation of ‘Little Jerusalem’. Tower Hamlets’ immigration history is distinctive because it has taken the form of relatively discrete waves. This pattern sets it apart from other diverse places in Britain, such as the neighbouring borough of Newham or the city of Leicester, where immigration flows have been more variegated. Immigrants to the areas now in Tower Hamlets have tended to settle in enclaves, for example giving Wapping a ‘Catholic’ character while Stepney took on a ‘Jewish’ one. Anne Kershen notes that for successive waves in the East End it was religion (though not necessarily religiosity) that provided cultural stability and the institutions of community life. A classic illustration of this phenomenon is the religious building on the corner of Fournier Street and Brick Lane, originally built as a Huguenot church in the 18th century. The building would become a Methodist chapel and then a Jewish synagogue before its current incarnation as the Brick Lane Great Mosque. Bengalis have in recent years become the single largest ethnic group in the East End. They have a long history of association with the locality. When the East India Company Dock was built in Blackwall in 1614, it became a focal point of contact between London and the rich Mughal province of Bengal. The first substantial population of South Asians in Britain were the lascars, sailors and ship engine room crews, many of whom came from the province of Sylhet at the Northeast of modern day Bangladesh. This was, and is, a rural and relatively poor region. Sylheti chain migration from family reunification and marriage fuelled much of Tower Hamlets’ population growth over the second half of the 20th century. The Bengalis had arrived for economic opportunities, and many began by working in textiles. Others started restaurants or small shops. Bengalis would over time come to account for the vast majority of ‘Indian’ Restaurant owners in Britain. Brick Lane in the East End became the heartland of settlement, with many businesses and community organisations originating there. As the Bengali presence around Brick Lane grew in the 1970s they were targeted by regular attacks from the National Front. Bengali men formed youth organisations to defend the community against this racist violence. 1978 became a watershed year when the murder of textile worker Altab Ali inspired thousands of Bengalis and other anti-racists onto the streets in solidarity. In the years following the Altab Ali murder, Bengalis took on a more public role. Young men who had defended the community from racist violence, such as Helal Abbas (Labour) and Sajjad Miah (Liberal Democrat), stood for election and became local councillors. The 1990s and early 2000s proved a significant period because Bengali campaigning aligned with strategic borough-level priorities. Brick Lane was redeveloped, partly driven forward by Bengali local councillors and cultural activists who desired to leave a lasting physical legacy in a historically transient area. Labour councillor Michael Keith provided continuity of vision during this time, alternating between leading the council and serving as lead member for regeneration from 1994 to 2006. The Council adopted a strategy of investment in three ‘cultural anchors’: the Whitechapel Gallery, the Rich Mix Centre, and Brick Lane, with the latter gaining a distinctive arch, streetlamps, and street signs in Bengali language and being rebranded as ‘Banglatown’. At the same time the nearby Truman Brewery and Spitalfields Market received extensive private investment to become de facto cultural anchors for commercial and artistic talent, and a major philanthropic campaign enabled the restoration of the iconic baroque Christ Church Spitalfields. The areas at the borough’s Western edge, bordering the City of London, were establishing themselves as attractive places to live, work, or visit. Muslim institutions have, over the past decade, taken on an increasing role in East London politics. In 2004, the large Bengali-led East London Mosque (ELM) on Whitechapel Road completed a major extension called the London Muslim Centre. The ELM has since that time become a core participant in local governance, building an impressive portfolio that includes youth work, a drug rehabilitation centre, a school attendance initiative, and partnerships with the Council, police, third sector organisations, and faith leaders. Other local mosques, including Darul Ummah in nearby Shadwell, have been following this example. Perhaps the most striking aspect of these recent Tower Hamlets controversies is that they have been aimed for national media, rather than simply playing out as local debates. Similarly, the national prominence of Tower Hamlets is evident in how it has been targeted by extremist groups including the English Defence League, the ‘Muslim patrols’, and Britain First’s ‘Christian patrols’, each of which has staged activities in the borough and raised their media profiles, even though they lack local followings. It seems that the East End remains as fascinating to outsiders today as it was in Victorian times. Tower Hamlets is now seen as emblematic of British multiculturalism, and as such has become a symbolic territory worth decrying or defending. The 2011 Census results revealed Tower Hamlets to be the fastest growing local authority in the country. In ten years the population increased a remarkable 24.6 per cent, from 196,100 to 254,100. The Census figures also demonstrated important changes in population composition. In 2001, white British residents were the largest ethnic group by a wide margin, at 43 per cent. That figure has fallen to 31 per cent as older residents have died and others have moved out of the borough. Bangladeshis in Tower Hamlets, who are predominantly Muslim, have narrowly overtaken white British residents as the largest group. However the proportion of Bangladeshis in the borough has actually slightly decreased, from 33 per cent in 2001 to 32 per cent today. In other words, the Bangladeshi growth rate has remained just below the overall growth rate. It is not exactly a ‘Muslim boom’. The underlying story from 2001 to 2011 has been the growth of other population categories. A total of 48,000 people were added to Tower Hamlets in the ten-year period, with the largest part of this increase in the ‘other white’ category, including continental Europeans, North Americans, South Africans, Australians, and New Zealanders. This relatively affluent set grew in size from 12,800 (7 per cent) to 31,600 (12 per cent), or an increase of nearly nineteen thousand people. Other growth in the borough has included Indians (up by 3,800), Chinese (up by 2,200), and the black categories that are likely include the borough’s growing number of Somalis (black Africans up by 2,900, and ‘other blacks’ also up by 2,900). The Census indicates that Tower Hamlets has been diversifying ethnically while remaining divided socio-economically. The East End today is a place of contrasts. Tower Hamlets has the highest rate of children living under the poverty line and, after Newham, the second highest rate of overcrowding. According to the recent report of the Tower Hamlets Fairness Commission, one in five households living in Tower Hamlets earns less than £15,000. Yet, largely because it contains Canary Wharf and areas that border the City, the average income of those who work in the borough is an astounding £78,000. Young professionals have been attracted to gentrified and redeveloped areas such as St Katharine Docks, the Isle of Dogs, Victoria Park, and parts of Spitalfields. The Northern half of Brick Lane includes art galleries and clubs associated with the Truman Brewery and has become a magnet for creative professionals. These fashionable areas seem a world away from densely packed council housing blocks such as the behemoth Ocean Estate. Michael Keith has noted, rightly, that the regeneration of Tower Hamlets has made it a ‘success story’ and ‘a very desirable and popular part of London in which to live’. However there is a possibility that redevelopment is now moving at such a pace that it will endanger the unique character of the East End as a refuge for immigrants and new ideas. The area has for a long time faced encroachment from the City of London. New plans for the Goodsyard by Shoreditch High Street Station, an area shared with Hackney, include a row of skyscrapers in excess of 30-storeys, in what could initiate a ‘Canary Wharf-isation’ of the East End. These disproportionate plans are being opposed by various campaign groups, most notably the East End Preservation Society. Today on Whitechapel Road the East London Mosque is a dominant architectural feature. According Council plans, in ten years it may lie in the shadow of the Crossrail station skyscraper. If any cultural influx threatens the future vitality of Tower Hamlets, it is homogenisation from these businesses and the new ‘wave’ of chain restaurants and luxury flats they will bring with them. Daniel Nilsson DeHanas is Research Fellow at the University of Kent. Until 2012 he was Research Associate on the Muslim Participation in Contemporary Governance project. His sociology research has focused on post-migration religion and politics. ‘East End’ conventionally refers to the area North of the Thames reaching from the Tower of London at its West side to the River Lea at its East, perhaps as far North as Hackney. See Alan W. Palmer (2000) The East End: Four Centuries of London Life. New Brunswick, NJ: Rutgers University Press. Anne Kershen (2013) Strangers, Aliens and Asians: Huguenots, Jews and Bangladeshis in Spitalfields 1666-2000. London: Routledge. William J. Fishman (1975) East End Jewish Radicals, 1875-1914. London: Duckworth. Ansar Ahmed Ullah and John Eversley (2010) Bengalis in London’s East End. London: Swadhinata Trust. Caroline Adams. (1987). Across seven seas and thirteen rivers: Life stories of pioneer Sylheti settlers in Britain. THAP books. Claire Alexander. (2011). Making Bengali Brick Lane: claiming and contesting space in east London. The British journal of sociology, 62(2), 201-220. John Eade (2000) Placing London: From imperial capital to global city. New York: Berghahn books. See Daniel Nilsson DeHanas (2013) ‘Elastic Orthodoxy: The Tactics of Young Muslim Identity in the East End of London.’ In Nathal Dessing, Nadia Jeldtoft, Jorgen Nielsen, and Linda Woodhead (eds.) Everyday Lived Islam in Europe. Farnham, UK: Ashgate. Ed Husain. (2007). The Islamist. London: Penguin. Page 280. Office for National Statistics, 2011 Census. For simplicity and ease of reading, all Census population figures are rounded down to the nearest hundred. George Mavrommatis (2006) ‘The New ‘Creative’ Brick Lane A Narrative Study of Local Multicultural Encounters.’ Ethnicities, 6(4), 498-517. I’m a bit late with this news but it merits recording, not least because it reminds us just how closely linked Tower Hamlets is to the City of London whose the borders still contain pockets of deprivation. 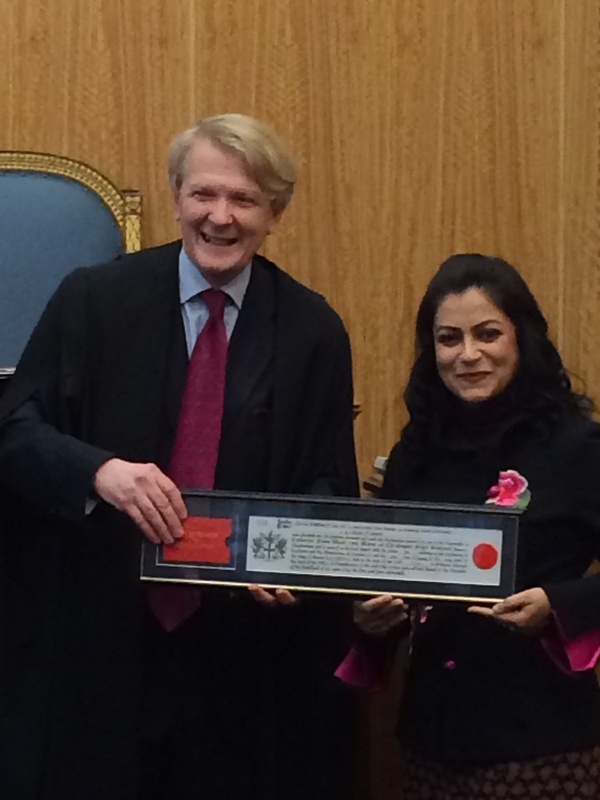 Friday before last, Cllr Shiria Khatun was made a Freeman of the City of London. It’s a rare honour (although more common than I’d thought: some 1,800 people a year are granted the privilege) and one which dates back to 1237. It was carried out in a court room at the Guildhall, where her guests included councillors Sirajul Islam, Rajib Ahmed, Helal Abbas and Bill Turner. Toynbee Hall chief executive Graham Fisher and David Goodhart, the Demos director and author of The British Dream, were also there, as was Munsur Ali, the chief executive of the Limelight Film Awards, whose new film Shongram about the aftermath of the 1971 War of Independence in Bangladesh is being shown at a private screening at Rich Mix tomorrow evening. The ceremony itself lasted only a few minutes and was all quite fun, albeit slightly strange. It was conducted by Murray Craig, the Clerk of the Chamberlain’s Court, who I think fancies himself, with some justification, as a stand-up comic. In fact, it was all perfectly civilised and pleasant, but I must say I much prefer the violence and poison of the Tower Hamlets council chamber. Contrary to popular legend, Shiria does not now have the right to drive sheep across Tower Bridge, but she does have the right to draw her sword within the City boundaries. One of the oldest surviving traditional ceremonies still in existence today is the granting of the Freedom of the City of London. It is believed that the first Freedom was presented in 1237. The medieval term ‘freeman’ meant someone who was not the property of a feudal lord but enjoyed privileges such as the right to earn money and own land. Town dwellers who were protected by the charter of their town or city were often free – hence the term ‘freedom of the City. From the Middle Ages and the Victorian era, the Freedom was the right to trade, enabling members of a Guild or Livery to carry out their trade or craft in the square mile. A fee or fine would be charged and in return the Livery Companies would ensure that the goods and services provided would be of the highest possible standards. In 1835, the Freedom was widened to incorporate not just members of Livery Companies but also people living or working in the City or there was a strong London connection. The Freedom in the City today is still closely associated with membership of the City Livery Companies. Visit the Livery page for an insight into the fascinating history and modern role of the Livery. The City of London is keen to maintain the Freedom as a living tradition. The Freedom is open to all who are genuinely interested and invited or born to it. The City Freemen are a very broad cross-section of the population​. Well, for the past couple of years, Shiria has been working with residents on the Portsoken estate which is in the Aldgate area and so within the City boundaries. In fact, it falls within the ancient Ward of Portsoken. She’s been helping families, and women in particular, who are suffering isolation and mental health issues. She’s also been helping the City Police and the Association of Chief Police Officers (Acpo) carry out the Prevent agenda of the Government’s counter-terrorism and extremism policy. I have known Shiria for more than two years, since when she has been working with residents in the Portsoken estate. Her role is very crucial when it come to engaging with residents on improving health as well as promoting and signposting them on to other services. Shiria has been working with the ‘hard to reach’ residents, mainly women whose English is not too good. She has done an amazing job in reaching out to them and as a result these women are now participating in activities as well as volunteering. Shiria has gone the extra mile by working with the City Police Prevent Team on engaging with women and families on how to engage with Prevent. As a result, Shiria went on to become the chair of the Shanaz Network which was set up by Acpo and the Home Office. It is the first network giving women all over the UK a platform to unite against terrorism of all kinds. Shiria was nominated on to the network by the City Police Prevent Team. She does this on a voluntary basis and it’s in addition to her work with the City residents and her role as a Tower Hamlets councillor. She has gained the respect of residents and the City Common Councilmen and Aldermen here in the Ward of Portsoken as well as other City wards. Shiria has contributed immensely to improving health of residents through engaging with them and facilitating activities that residents want to do. Shiria’s hard work and commitment to the residents of the City has resulted in us awarding her the Freedom of the City which she deserves. I am really honoured and privileged to have been nominated for the Freedom of The City of London. I have been working with residents of the City for the last two years via Toynbee Hall. The City is truly a fascinating place. It’s not all about the corporate industry, there are some amazing people living there too. Walking around the City you get to see some of the historical buildings that still exist as well as new emerging glass type office buildings. My work involves working with residents of the Portsoken estate (previously many years ago was part of Tower Hamlets). When I first came to this estate two years ago I was amazed to see how residents co-existed with each other in harmony. Neighbours supporting and helping each other as family members would. As it’s a small ward/estate, the majority of the residents know each other well and this makes it easier to know who’s who and what’s what. You might be asking where the issues are? Well, there are significantly high health issues and this is where my role comes in to place. Working with residents and City of London departments I have been trying to reduce health issues/inequalities affecting residents of Portsoken. What are some of the health issues you ask? Well, like the neighbouring borough Tower Hamlets, residents of Portsoken have/are experiencing something similar such as diabetes, heart disease, physical inactivity and mental health problems. I must say it is impressive how the City of London has been supportive of its residents in Portsoken to reduce those health issues. Through key interventions there has been a visible reduction in physical inactivity. For me this is rewarding knowing that I have been able to help many residents to better their lifestyles through healthy eating, exercise and the many other interventions on offer. I decided to go even further by giving up some of my extra time beyond my working hours to work with the City of London’s PREVENT team, who nominated me on to the Shanaz Network which was initially set up by ACPO and the Home Office approx two years ago (I have only been involved with the network since last November). It is the first network of women from all over the UK countering terrorism and radicalisation of all forms. The women on the network like myself have been nominated by local/regional PREVENT teams. I am the Chair of this network. Now you’re probably asking where I find time to attend/deal with Shanaz Network business? Well I take annual leave for all this; yes, I do because I feel this is an important piece of work and for the first time we now have a platform for women to come together and have their say. After all, who better than women to know what’s happening in their communities and how best to keep it safe? I was invited to attend the last Extremism Task Force meeting where I made my contribution. As stated before I am honoured to be awarded Freedom of The City of London. My family, friends and colleagues have shown immense enthusiasm and support. Remember this photo from 2008? I wrote about it on this blog in 2010. 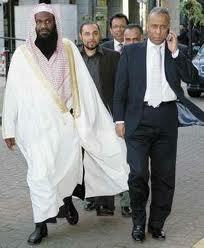 It shows Lutfur Rahman, then the council leader rather than his current position as executive mayor, with Sheikh Adel Al-Kalbani walking by the Tower Hamlets town hall at Mulberry Place. Behind them are Rofique Ahmed and Shafiqul Haque. Both were then, like Lutfur, Labour councillors. They are now, according to officers who have worked with them, two of the least productive independent members of his cabinet (but they still get some £20k a year for their ‘work’). Al Kalbani was at that time the Second Imam of Kabbah, the Grand Mosque in Mecca, considered by Muslims as the most sacred place on Earth. He had been appointed to the position by the Saudi royal family shortly before his trip to the UK where he was attending the annual Islamic Global Peace and Unity event at the ExCeL centre (Lutfur spoke at this year’s gathering last month). As he had some down time, according to a conversation I had with Lutfur about it a bit later, he decided to pop over to the town hall where he found Lutfur’s office door open and so they had a cup of tea. “He’s a very pious man,” Lutfur told me. Ever so spontaneously, Al Kalbani then led prayers at the town hall’s second building, Anchorage House, for staff and councillors. The episode was cited by Cllr Helal Abbas in his dossier of evidence to Labour’s NEC in 2010 as proof that Lutfur was taking a less than secular approach to politics. In the months and years after his visit, Al Kalbani, a Sunni, seemed to develop some rather hardline views, arguably against Christian and Jews in Saudi Arabia, but particularly about Shia Muslims. He says Shia scholars are apostates (the punishment for whom in Islam can be a bit harsh), that Shia laymen are ignorant, that there can be no such thing in Saudi Arabia as a “Christian citizen”: they can only be guests, because the guidance from the Prophet Mohammed was to drive Christians and Jews from that land. In Britain, there is increasing concern about the Sunni/Shia divide. Counter-extremism experts believe the crisis in Syria, which on a simple level is Sunni rebels trying to topple Shia President Asad’s regime, might fuel latent dislike. In May, Anjem Choudary’s hardline Salafi mob (Salafis follow the Sunni tradition) led a violent demonstration against Shias in Edgware Road. It is possibly for this reason that the “very pious” Al Kalbani has been refused entry to the UK. Harry’s Place had a piece on this a couple of days ago, while I wrote this article for the Express yesterday. The Home Office refused to elaborate on why his visa was declined. This Government is clearly taking a much harder line against potential problem preachers coming to these shores. It means the Water Lily Centre on Mile End Road didn’t have a star guest today, and neither did the Esha’atul Islam Mosque in Whitechapel last night. ONE of the most senior Muslim clerics in Saudi Arabia has been refused entry to the UK, just as he was to embark on a speaking tour of British mosques. Sheikh Adel Al-Kalbani, a former senior imam of the Grand Mosque in Mecca, was prevented from boarding his plane in Riyadh on Wednesday. He was due to fly to London, where he had been expected to give a lecture in Whitechapel last night and another one in Wembley today. It is not known why a visa for Al Kalbani was refused. He has previously been allowed into the country and in 2008 he was a guest of the then leader of Tower Hamlets council in east London, Lutfur Rahman. 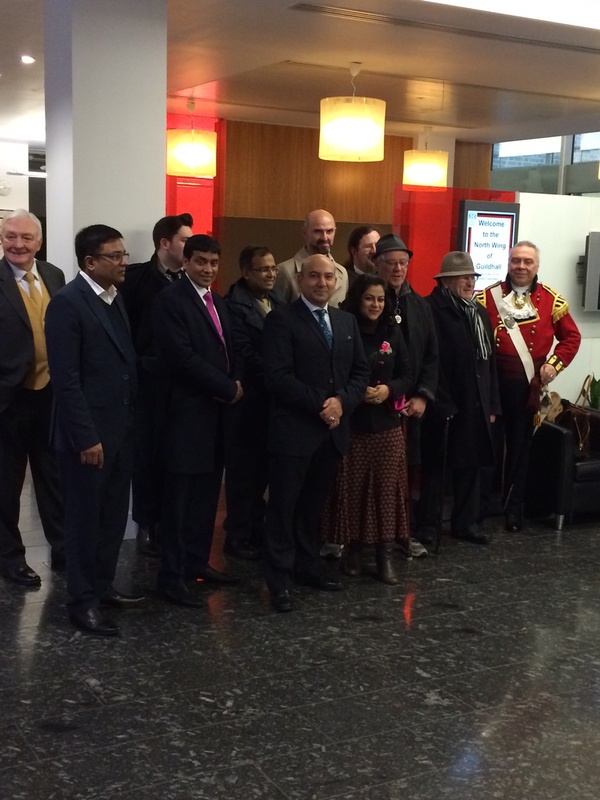 Mr Rahman is now the directly elected mayor of Tower Hamlets. Since 2008, the Sunni cleric has been quoted expounding potentially divisive views regarding Shia Muslims. There has been increasing concern among extremism experts over attempts to divide Shia and Sunni Muslims in Britain. Followers of radical hate preacher Anjem Choudary led a demonstration in London in May against Shia Muslims. According to the Arab News website, Al-Kalbani had performed the noon and afternoon prayers before heading to the King Khaled International Airport. He said he had received his visa from the British Embassy in Saudi Arabia in October, just two weeks after submitting his application. The British Embassy apparently did not explain why he was then later refused. He said: “I don’t really know why they denied me entry. I was in Britain about four years ago and other countries. “I was told that other Muslim scholars have also been denied entry and had their visas cancelled. He said he would not be appealing the decision. He said Allah “has chosen the best for me”. 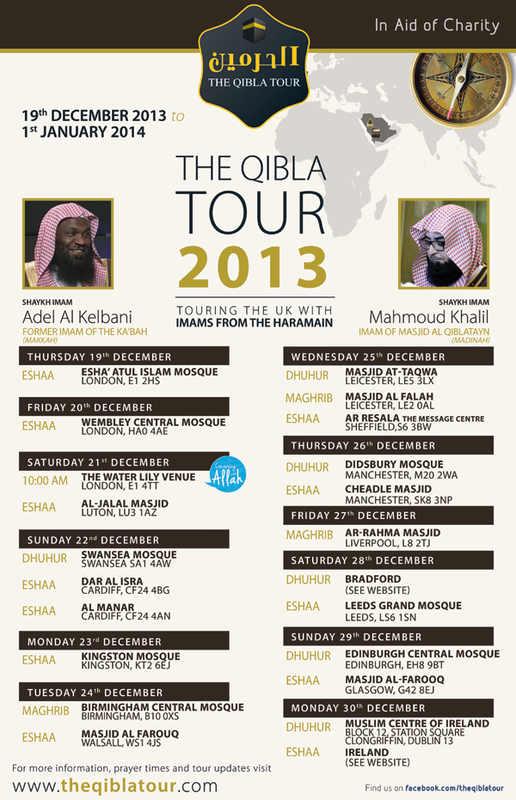 Al Kalbani was the star billing on the Qibla speaking tour over the next 10 days. He was due to talk at the Water Lily centre in Whitechapel tomorrow, then at Luton later in the day, then Swansea and Cardiff on Sunday. He had a talk planned in Kingston, Surrey, on Monday while Muslims in Birmingham and Walsall were due to welcome him on Christmas Eve. A Home Office spokeswoman said she was unable to comment on specific individuals, but added: “All visa applications are considered on their individual merits and in line with the immigration rules. I’ll leave it for you to debate whether this sheds new light on Abbas’s warning three years ago.